multi storey floor slab system. 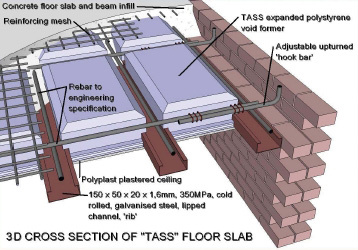 TASS is a combination of a moulded EPS block and cold rolled steel channel to form a 'rib and block'/coffer slab system for multi storey buildings. The system comprises a priority high strength galvanised steel rib which supports the high density TASS EPS void formers. The system is completed by the placement of reinforcing bars between the TASS blocks in both directions, reinforcing mesh above the blocks and concrete to fill the channels, encapsulate the rebar and mesh to form the structure of the floor slab. The beams which are created by the concrete infill and rebar in the gaps between the TASS blocks creates a monolithic structure. The TASS void formers are left in place and act both as a thermal and sound insulator. 1) The floor slab is designed taking into account the span and load bearing requirements combining the variables of rebar size and configuration, concrete beam depth - which can be controlled by the TASS block depth, and the horizontal floor slab and reinforcing mesh. 3) Steel ribs are placed uni-directionally onto the supporting walls. These are propped at 1,6 metre intervals to support the wet concrete and construction loading. 4) Steel reinforcing is fitted between the TASS blocks in both directions. 8) Ceilings can be either suspended or plastered with Polyplast, propriety EPS plaster system, available from ABP Building Products. All the components of TASS are lightweight and can easily be installed without cranes, lifting equipment or excessive labour. TASS is approximately 35% lighter than competitive concrete rib and block systems. This equates to a saving of about 150kg/m2. As the TASS components are made to close dimensional tolerances (EPS blocks are moulded in closed moulds and the steel channels roll formed) and lightweight they can be quickly and easily positioned. The TASS blocks can readily be cut with a handsaw when full blocks do not fit and complex shapes have to be covered. Electrical and other services can also be cut into the EPS and run through the blocks themselves. During the construction phase the TASS blocks can support workmen and equipment allowing full access to the working area without fear of breakages or damage. Similarly the system will support the concrete pour provided the channels are propped at the recommended intervals. EPS is used extensively as a thermal insulating material and performs this function in the slab moderating building temperatures and reducing energy costs associated with heating and cooling. EPS also acts as a sound barrier and in combination with the concrete slab mutes all sound waves that could potentially be transmitted through loor slabs. A fire retardant grade of EPS is used to manufacture the TASS slabs and as a result they do not add to any existing fire hazard and will not contribute to the development phase of a fire and will not propagate flame. EPS is rot, rodent and termite proof and is dimensionally stable and will thus retain its thermal and sound insulating properties for the life of the building. TASS is cost competitive when comparing material cost only vs. traditional concrete systems but becomes increasingly competitive when including the cost of labour, equipment requirements and time. Fewer props are needed per mtr sq for TASS when compared to concrete systems. The concrete components of traditional 'rib and block' systems all need lengthy cure periods after manufacture to reach full strength often increasing supply lead times. The TASS EPS blocks are moulded in seconds and the ribs cold rolled and cut to size immediately. These alternative manufacturing methods means that system supply lead times can be significantly reduced. The TASS system can span in two directions which makes complex designs easier to configure. Both the TASS blocks and the steel channels can be readily cut (and welded) on site to accommodate odd shapes and openings. Steel formwork edges to limit the concrete can be formed from various sizes of channel. Skylights are easy to install by leaving out TASS blocks and creating edge formers from cold rolled steel sections. Design TASS floor slabs as per procedure laid down in SANS10100 section 4,5 design code. The design program used to analyse the system is commercially available from Prokon. Channels: 150 x 60 x 20 x 1.4mm 350 MPa min. yield pre-galvanized cold rolled steel. Plaster: Polyplast resin solution mixed 1:10 with plaster sand. For additional information on TASS please download the resources below.